This year the festival will offer Muslims and non-Muslims alike an ideal opportunity to learn and deepen one's understanding and knowledge of Islamic heritage and culture in the fields of arts, culture, science, philosophy and history. Designed to celebrate the Islamic contribution to human civilisation, the four day family event will touch on all aspects of the Muslim life through a vibrant series of exhibitions, workshops, live shows, concerts and debates. 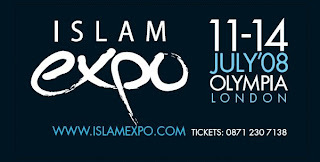 Islam Expo has been conceived as an open forum where people from different backgrounds come together to discuss key contemporary issues that are affecting the wider society. The event's aim is to help bring Britain's diverse communities closer together, promoting dialogue by expressing our differences whilst acknowledging our many similarities, in the spirit of the 2008 European Year of Intercultural Dialogue motto: "Together in Diversity"
Features include theatre performances by Khayaal, an Arts and Crafts Zone, a Cookery Zone, an Islamic Gardens Zone, debates and seminars, an exhibition area and for the first time, a ladies only fashion show! This is a great chance to see products from web-based companies for yourself! The fashion show, which is sponsored by Sisters Magazine, will take place on Saturday 12th and Sunday 13th. Designers showcasing their collections include Aab and Shukr as well as Imaan Collections, Arabian Nites, Silk Route and many others. I will be volunteering backstage at the show, so I look forward to seeing lots of you there inshallah! It will be unmissable! Buy your tickets for the Expo here. oohh oohh me going me going lol. i cant wait and im really excited, got my tickets free for the family so alhumdulillah im really excited. wanted to go living islam but its too far to drive on my own with the boys. but inshallah next year hubby is putting his dates down for work, so we will go then inshallah. inshallah will see some of you sisters there, maybe we should have a pin so when we pass each other we can say hi your from blogger lol. does anyone know if I can attend for 2 days, or is it only single entry? Anon, when I went last time it wasn't too bad. Plus the Friday and Monday will definitely be less busy! Khadijah, yay, might see you there then inshallah! Name badges are a good idea lol..
Anon 2, the ticket covers entry for all 4 days of the Expo, so you can come and go whenever you like.